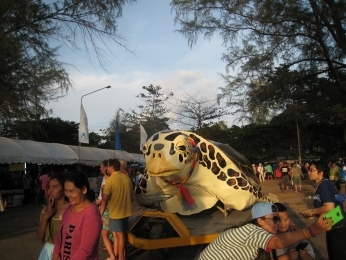 An International campaign was launched on 1st March 2006, under the banner of the Year of the Turtle 2006, uniting peoples from Australia to Thailand and Iran to South Africa. 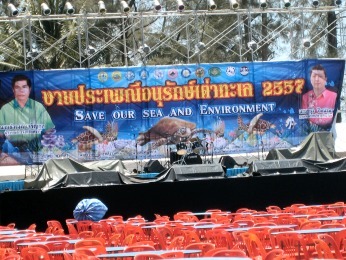 The organisers hope to spotlight the threats and encourage even greater public support for these extraordinary marine creatures. Quite frankly they need all the help they can get. 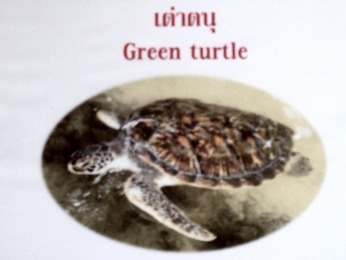 The green turtle is found in scattered areas in both the Andaman and South China Sea coasts, nesting in both areas. They are listed as globally threatened by the World Conservation Union (IUCN) and are protected by International Law (CITES) and Thai Law. 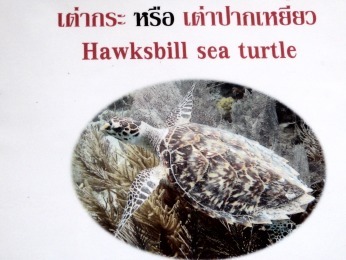 Hawksbill turtles are found near off-shore islands in the coastal waters of the Andaman Sea, and the northern Gulf of Thailand. They are listed as "Critically Endangered" in IUCN's Red List. 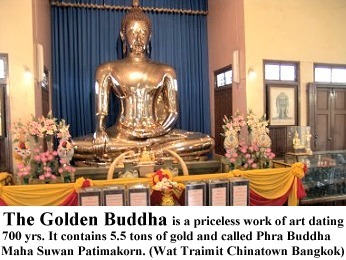 It is listed in CITES, and is protected by Thai Law. The number of nests on three major nesting beaches has declined dramatically between 1985 and 2002. 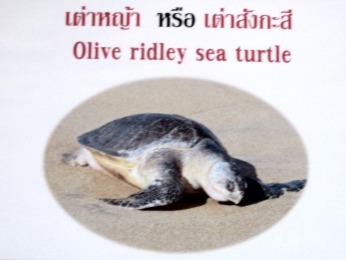 Olive Ridley's are listed as "Endangered" by IUCN, and are protected by CITES and Thai Law. The leatherback is only known to nest on the Andaman Coast. The leatherback has been listed as globally endangered since 1970, and was confirmed as "Critically Endangered in Thailand" in 1996. 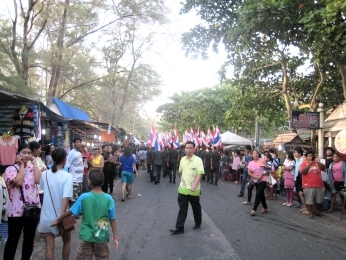 It is listed in CITES, and is also protected by Thai Law. The sea turtle is a reptile which spends all of its life in water. It obviously needs to go to the surface from time to time, to breathe air. Bear in mind they can actually drown if severly frightened by divers. The natural longevity of the sea turtles is not entirely known, but they grow very slowly taking about 15 years to reach maturity. 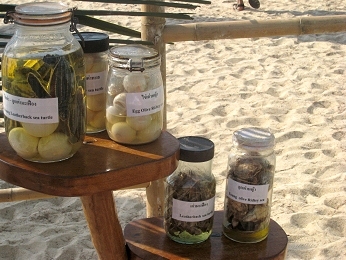 The sea turtle's diet includes sponges, marine worms and molluscs. 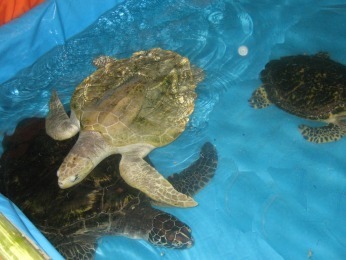 Adult Green turtles for example are largely vegetarian, eating underwater grasses and seaweed, whilst the Hawksbill turtle is carnivorous and eats invertebrate animals of the coral reefs. 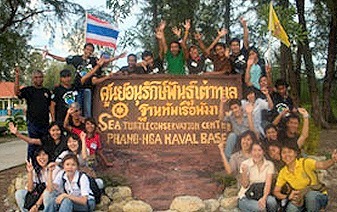 In the Gulf of Thailand the most important nesting areas for green and hawksbill turtles are Khram and adjacent islands which are located in the inner Gulf, Chonburi Province. 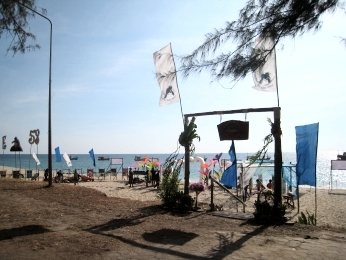 There are some islands along the east coast from Chonburi, Rayong and Trat Province and some islands in the middle Gulf of Chumphon and Surattani Province where sea turtles are occasionally found. In the Gulf areas, green and hawksbill turtles lay their eggs all year round with the peak from May to August. 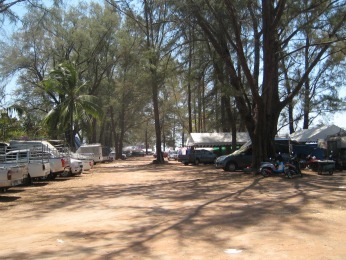 In the Andaman Sea coastal areas of Thailand, the main nesting areas are north-west coast of Phuket, and Phang-nga provinces. 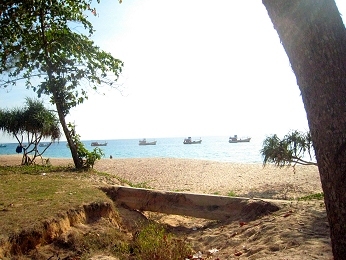 In particular these areas include Thai Muang Beach and Phrathong Islands of Phang-nga Province, Maikhao beach Phuket, Tarutao Island and Adang-Rawi Islands of Satun Province . 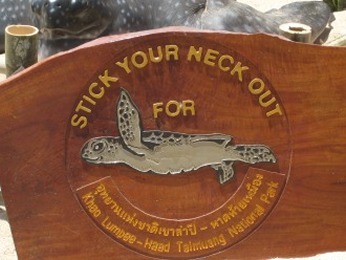 Olive ridley and (occasionally) leatherback turtles are found in these areas. 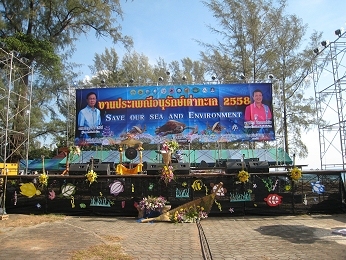 The green and hawksbill are found at the Similan Islands, Surin Islands and Tarutao Islands. 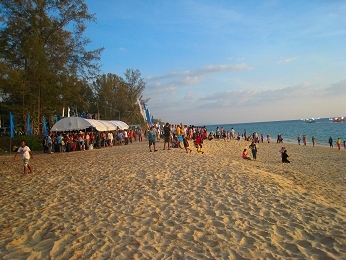 The nesting season of sea turtles in the Andaman Sea region occurs only from October to March with a peak from mid-November to mid-January. Turtles usually lay their eggs between November and March. The females come ashore after dusk, but they have been observed nesting until just before dawn. They select their nesting site and dig a small pit 18 inches deep using their rear flippers. A clutch of between 40 to 180 eggs will be laid, after which the pit will be carefully concealed by sand before they return to the sea. The whole process usually takes about one hour. During the egg laying, the eyes of the turtle will be covered by a colourless mucus to prevent dehydration and keep out the sand grains. After an incubation period of 60 days, the hatchlings dig their way up to the surface of the pit, usually at night when the sand is cooler. Hatchlings locate the water's edge by orienting themselves to the horizon, but distant house lights can disorient the youngsters so that they actually crawl away from the sea. The best diving areas to see turtles are the Similan and Surin Islands National Parks, visited by liveaboards from Khao Lak. Turtles are most commonly seen in shallow reefs on dive sites such as East of Eden (Ko Payu, Similans) or Ko Torinla (Surin), but you may see them deeper on rocky sites such as Elephant Head Rock or Deep Six (Ko Payu, Similans). 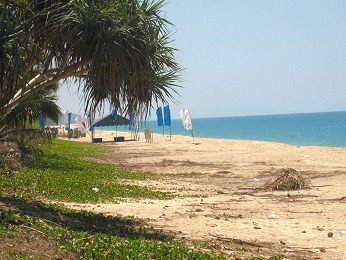 The usual sightings are Hawksbill and Green turtles. 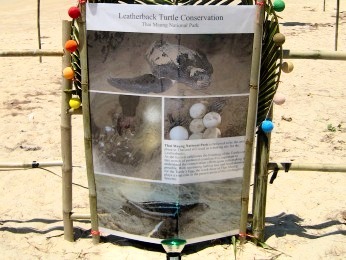 At Thai Muang (National Park) beach, Leatherback and Olive Ridley are the two main species of nesting turtles. 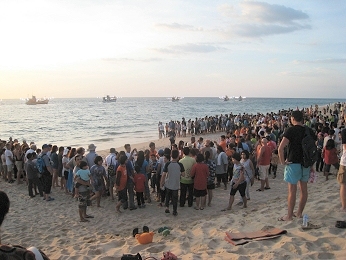 There is an annual 7 day event here, usually during the first week of March, to release young turtle hatchlings, which have been raised by the Fisheries Deptartment, back into the sea. This is designed to heighten people's awareness of the declining numbers of nesting females and promote conservation efforts. 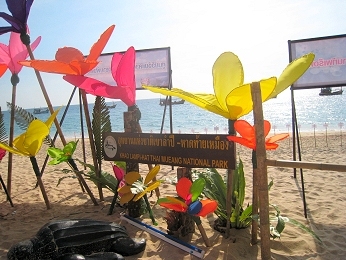 Marine Turtles have been given legal protection in Thailand for many years, and His Majesty King Bhumibhol Adulyade and Her Majesty Queen Sirikit have initiated several specific turtle conservation projects. 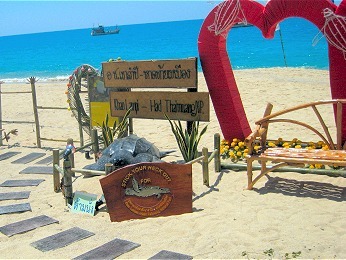 The Royal Thai Navy has an active role in the turtle conservation program and regularly patrols beaches in the Similan and Surin Islands in the Andaman Sea, for intruders and poachers. They also protect the green and hawksbill eggs laid on the remote islands and keep them safe from predators such as birds and crabs. 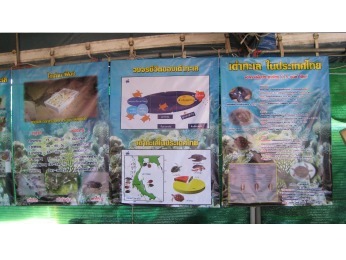 Once they are born, the turtles are brought to the Navy's turtle protection centre in Phang-nga province where they are nursed for another six months before being released into the sea. 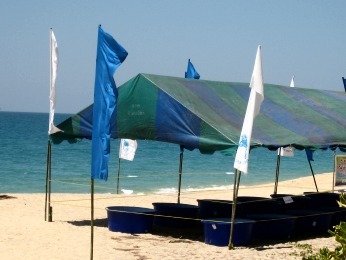 Thap Lamu (approx 6 km south of Khao Lak) is the location of the Royal Thai Navy's Third Fleet Sea Turtle Nursery. 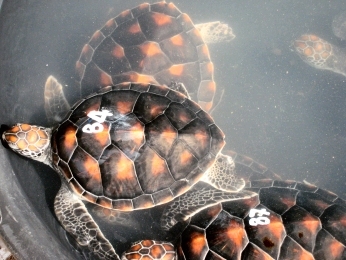 Infant turtles from various areas on the Andaman coastline are brought here, nursed along until they are strong enough to fend for themselves, then released into the sea. 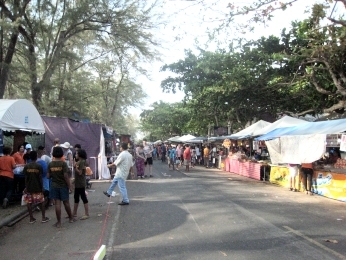 It is the country's most important such nursery on the Andaman coast. 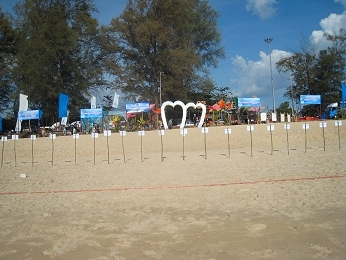 There are several NGO's (non-government organisations) and volunteer groups working in Thailand with the aim of protecting sea turtles. 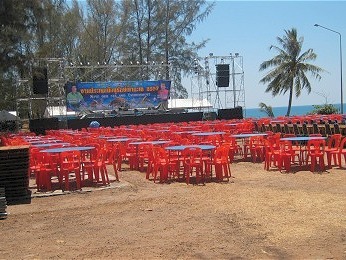 Naucrates, for example, have greatly reduced egg poaching on the islands of Ko Phra Thong and Ko Khao, just north of Khao Lak. 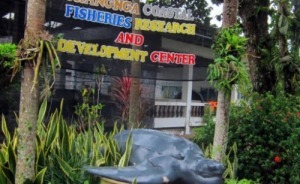 This centre takes care of injured turtles and also has some hatchlings. 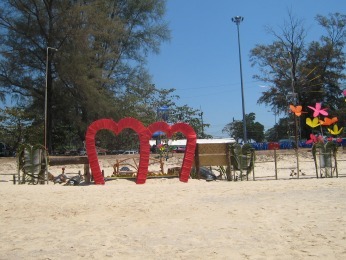 It also has some fish such as the clown fish. 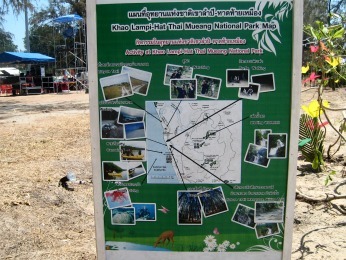 The centre is situated about 1 km from the Thai Muang National Park HQ. 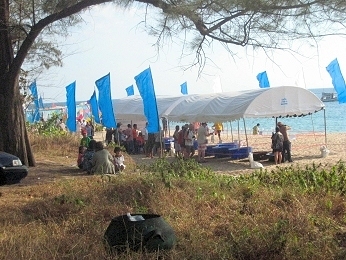 It has sponsors which organise turtle charity events from time to time, in order to raise funds for the project. 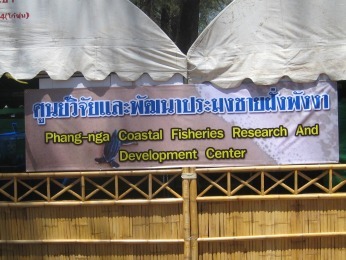 The Phang Nga Coastal Fisheries Research and Development Centre is open to visitors daily and is free to enter. 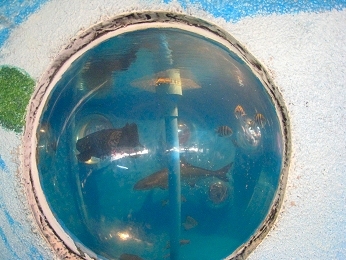 There are numerous large concrete saltwater holding tanks where guests can view different hatches of turtles. Through their first few vulnerable months the juvenile turtles stand a much better chance of survival at the sanctuary, as they are safe and away from predators. 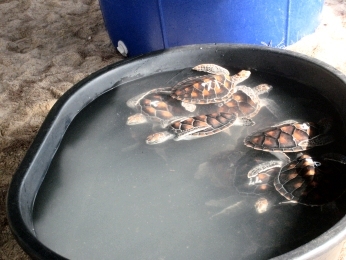 They are kept at the turtle sanctuary until they reach a minimum age of eight months old. 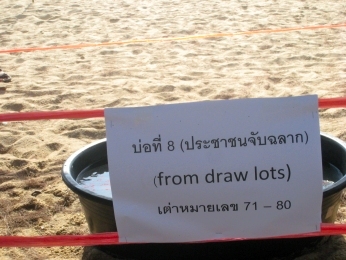 After this point, for a donation to the research centre, visitors can release a turtle into the sea. 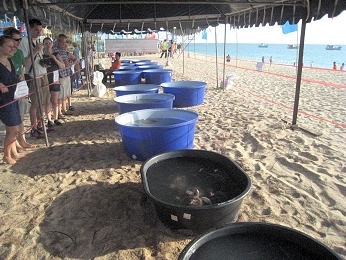 There are also breeding age adults, and rehabilitation tanks for sick or injured turtles. 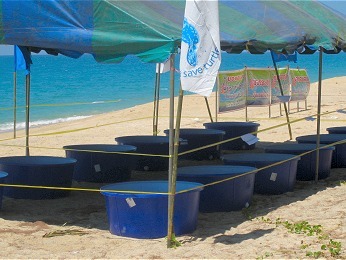 As well as turtles, the centre reserves many tanks for their Anemone fish breeding programme. There are many other tropical fish species bred and researched at the centre, all of which can be viewed by the public. One of the prime objectives of the Park is to offer protection to the visiting nesting turtles and increase the survival rate of the young. Even so it has been estimated that the hatchlings have a one in a thousand chance of making it to adulthood. They come ashore to lay their eggs on moonlit nights between November and April, at which time the beach is patrolled by Park rangers. 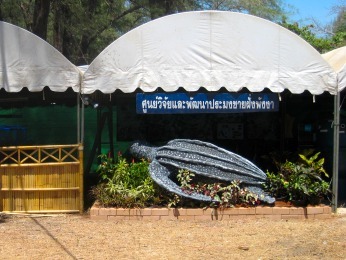 For conservation and protection purposes, most of the eggs are removed by staff to a nursery. 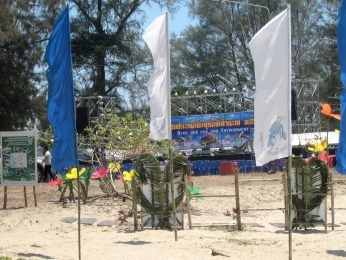 Incubation takes 60 days, after which time the youngsters are released naturally back into the Andaman Sea. 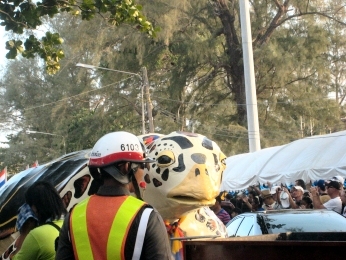 At first glance some aspects of the so-called Turtle Releasing Festival, with its associated food and plastic wares market, parades and speeches seem incongruous and excessive. 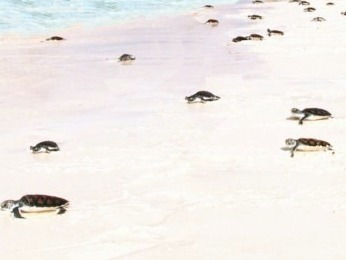 Baby turtles instinctively heads towards the brightest horizon. 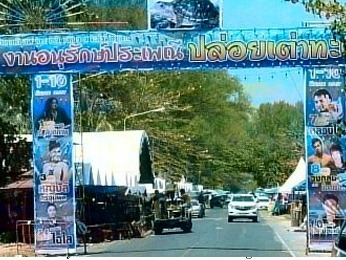 To avoid distractions from the on-shore festival, and to ensure the youngsters head in the right direction, the Royal Thai Navy enlists the help of the local squid boat fleet. 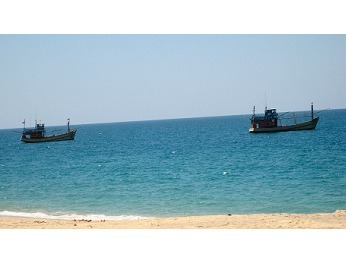 The squid boats line up a couple of hundred yards off shore and splay their long arms of powerful bulbs. Shortly after dark, and in a dazzling blast of luminescence, the squid boats light up the shoreline, and the hatchlings do in fact make it to the sea. 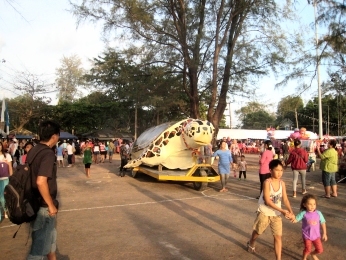 The Turtle Release is an annual event and takes place on the 1st March, with the accompanying Fair lasting for seven to ten days thereafter. 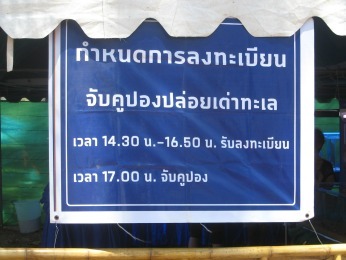 The release takes place at about 6.00 pm on the first day only . 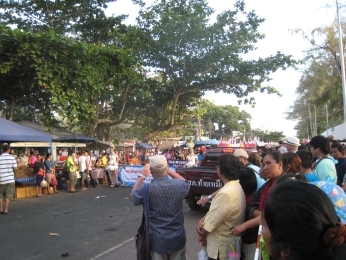 It is preceded by a procession at about 5.30 pm down the beach road to the release site. 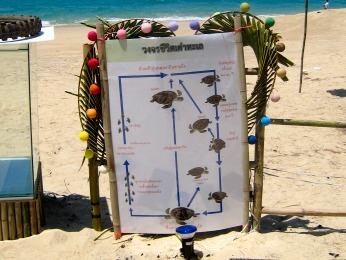 The following are some photos of the turtle releasing fetsival at Thai Muang on 1st March each year. 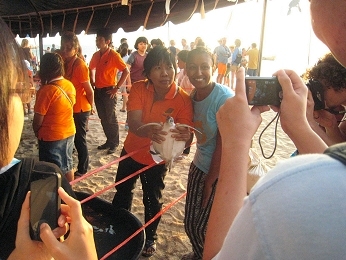 Here are some photos of the turtle releasing festival at Thai Muang on 1st March 2015. 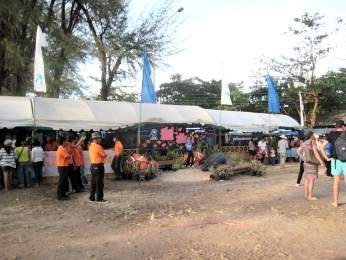 And some more photos of the 1st March 2015 event. The Leatherback species is believed to be on the brink of extinction worldwide. Since the 2004 tsunami, Leatherback turtles are rarely seen laying eggs and the last recorded event was about six years ago. 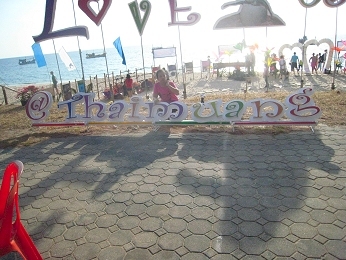 But in mid december 2018 there were two recordings (at Khuk Khak and Thai Muang beaches). The females typically lay about 90 eggs at a time.